Illinois Approves Rescue Of Its Ailing Pension System : The Two-Way The bill would cut benefits and push back the retirement age for younger workers in an effort to close a $100 billion shortfall. The governor has said he will sign it, but the state's public employee unions bitterly oppose it. 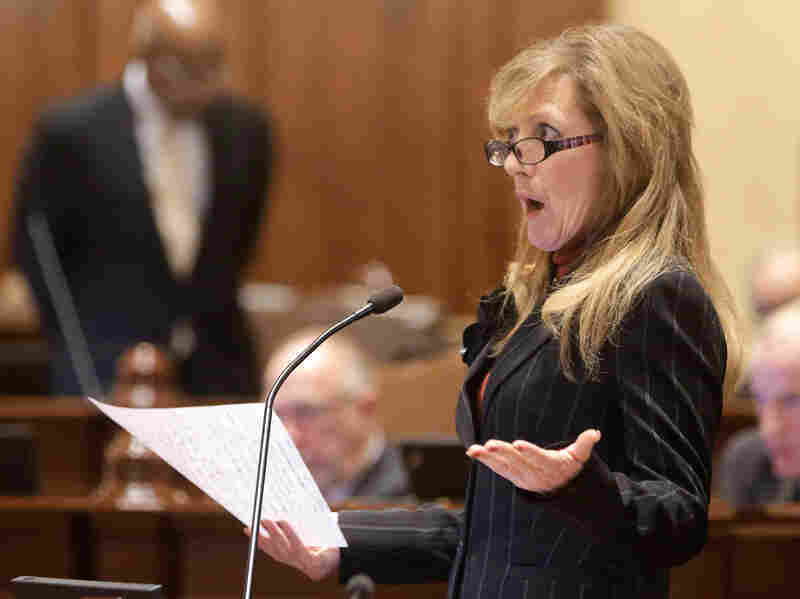 Illinois Sen. Linda Holmes, a Democrat, discusses pension legislation at the state Capitol on Tuesday. Illinois lawmakers have approved a sweeping plan to close a $100 billion shortfall in the state's pension system, which would cut retirees' benefits. But the legislation faces promised legal challenges from public employee unions. NPR's David Schaper reports that the pension bill "passed by the narrowest of margins in the Illinois Senate, and with just two votes to spare in the House, as several Republicans argue it doesn't cut pension benefits enough, while some Democrats say state workers and retirees shouldn't suffer because of the Legislature's failure to adequately fund pensions." Democratic Rep. Elaine Nekritz, who helped craft the pension changes, says she doesn't "take any joy" in the vote. "Yet it's the responsible thing to provide for a pension system that gives workers retirement security without bankrupting our state," she says. Illinois Gov. Pat Quinn has said he will sign the bill, but public employee unions have vowed to try to block it in court. "... would push back the retirement age for workers ages 45 and younger, on a sliding scale. The annual 3 percent cost-of-living increases for retirees would be replaced with a system that only provides the increases on a portion of benefits, based on how many years a beneficiary was in their job. Some workers would have the option of freezing their pension and starting a 401(k)-style defined contribution plan." "The changes most egregious to unions are reducing how much pensions will grow over time, by scaling back cost-of-living increases, as well as raising the retirement age."